On a crisp Spring evening, my man and I ventured to the eclectic suburb of North Fitzroy to visit a venue called ‘The Shelley Room’. Upon finding the venue, we were warmly greeted by the ever gracious and gorgeous host, Camilla Cream, who led us to our seats. The intimate theatre was well set up with a roomy stage backed by coloured curtains (echoing perhaps the billowing of a circus tent) with fairy lights strung across the ceiling. Rows of seats were near the stage, with tables and some lounges down the other side of the room. While we waited for the show to start, we enjoyed the friendly atmosphere of the room and its patrons. The European cabaret music playing in the background added to the bohemian atmosphere. I have been trying to attend this event for months, so I was super excited to have finally made it along and was curious to see what sorts of adventures the evening had in store for my man and I. Opening the show was debonair MC and entertainer Chante Dumont. Ever so charming, Chante sung the audience a special version of ‘Be Our Guest’ which included amusing burlesque themed lyrics. This was especially entertaining as Chante sounded exactly like Lumiere (from Beauty and the Beast) with an additional Gomez Addams charm. Rarely do I find MC’s to be as engaging and witty as Chante was so I was impressed! Chante continued to be the consummate entertainer throughout the show as he introduced each act with blurb of information. Viola Verve was the first burlesque beauty to emerge on stage with a classic burlesque tease routine. 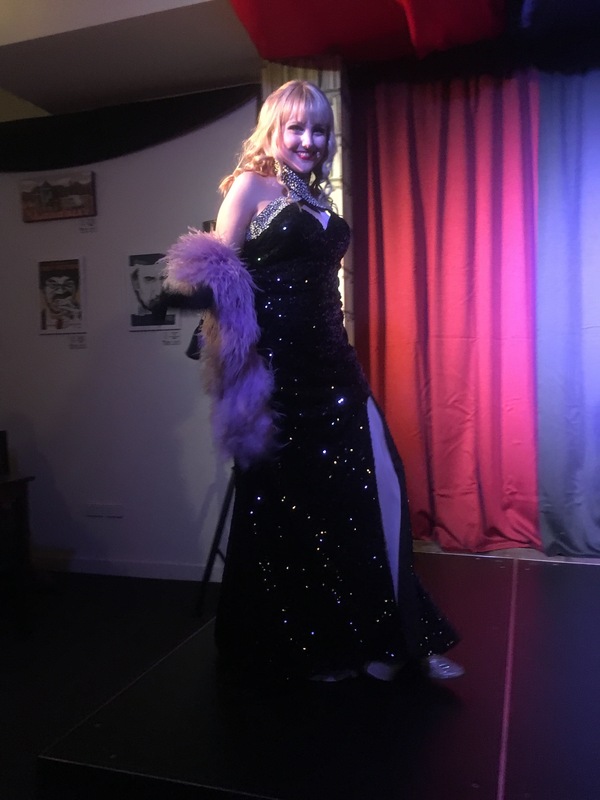 Viola was sassy, sweet and sultry, teasing the audience with her fluffy feather boa while giving the audience sly smiles and winks. Her act was the perfect show opener – a mix of sweet and spice to make the audience feel nice! 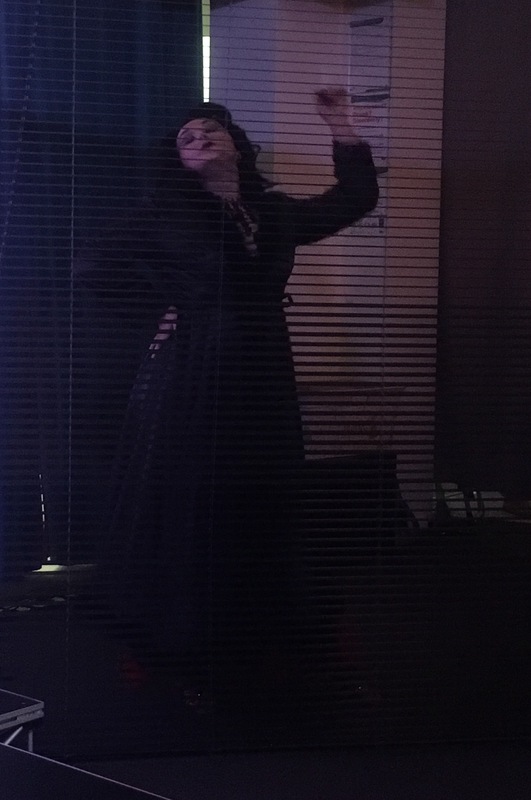 Appearing next to the side of the stage behind a set of blinds, was O Nyx with a noir themed routine. I loved her use of the blinds to increase mystery and echo films of days past, as she piqued the curiosity of her audience. O Nyx performed a seductive routine, playfully pulling the audience into her noir world. She was irresistible, and I doubt anyone in the audience was immune to her charms. Delving into a completely different storyline, Kerryx appeared on stage with her traditional burlesque fans (the large kind that can cover your entire body) swapped out for palm leaves and greenery. 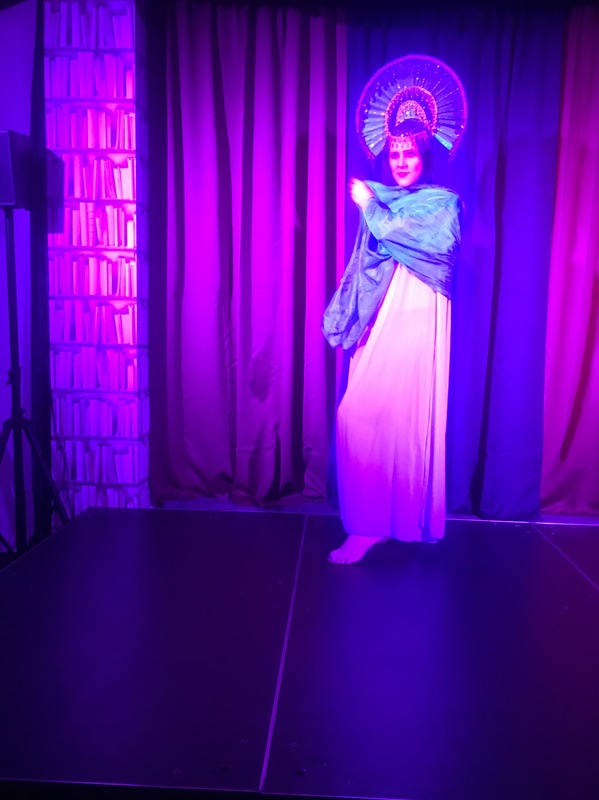 The audience was invited to luxuriate in original sin as Kerryx depicted Eve. I enjoyed Kerryx’s use of her gaze as she would lift her eyes and slowly gaze at the audience, almost daring them to look away. This was truly a garden of delights, as the audience had a chance peep through the palm fronds into the garden of Eden. It was a fine display of the female form and a clever routine. I especially enjoyed when Kerryx ventured out into the audience, caressing faces and offering a lucky chosen person or two to take a bite of her apple. I found this routine to be ‘other worldly’, possessing a celestial charm. 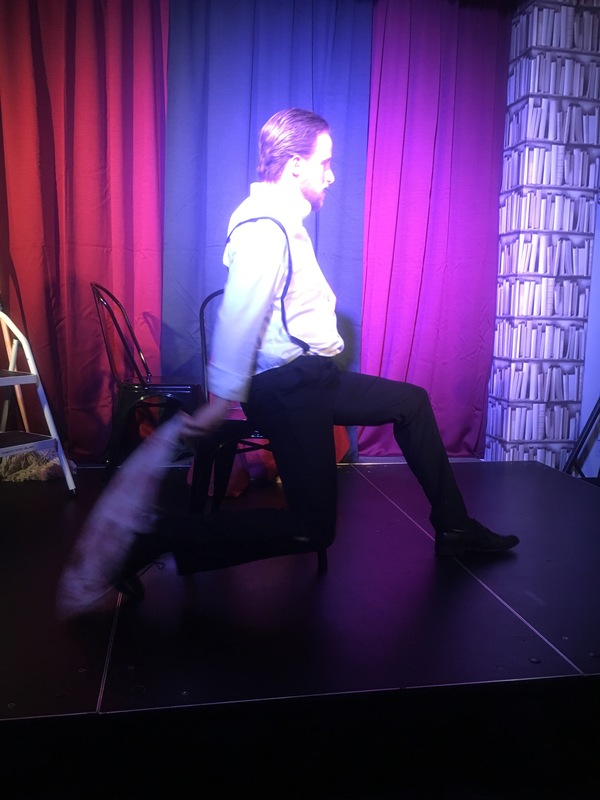 On this evening, the audience was treated to some Boylesque (for those unaware, this refers to Burlesque routines performed by males). With a full stage set up with props, Sonny James emerged a complete storyteller as he made his way past the audience and pretended to clean tables along the way. Sonny made use of all props (and costume elements) available to him, which I enjoyed. 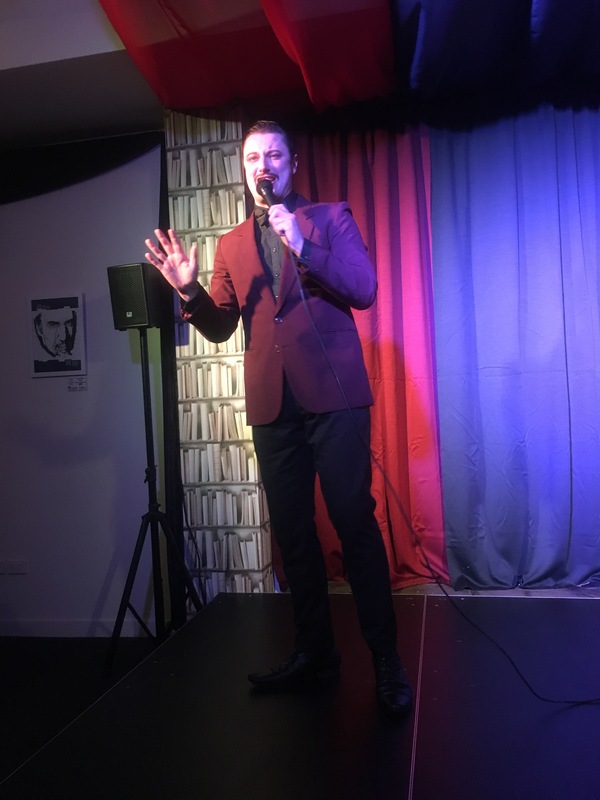 While his routine took some time to reach the exciting moments, Sonny was a crowd pleaser and by the end of the performance he had raised the temperature of the room – especially evident by the increasing levels of noise and applause from the audience. The final act of the show’s first half was from Chastity de Vice. 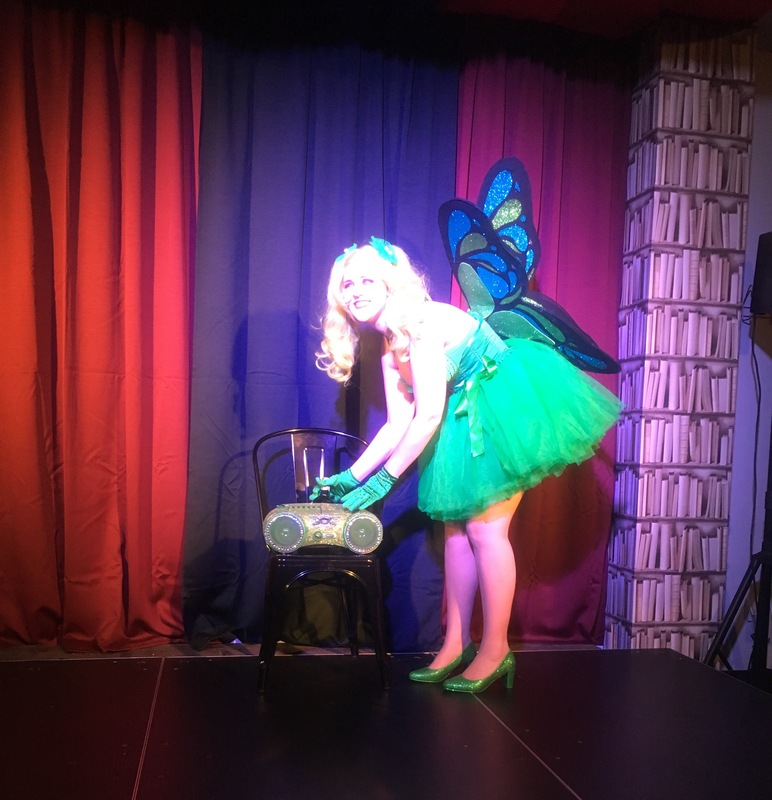 Again, the theme of her act was different, with Chastity appearing as a green fairy – with almost a ‘children’s entertainer’ vibe about her. Naturally, this made me VERY excited! My eyes lit up with joy when she took to the stage in her fairy outfit, toting booze and starting her sparkly boombox. Oh, how Chastity danced for her audience! It almost seemed as though a 90’s DJ had taken over her boombox until the dance of the sugarplum fairies was playing – mixed in with some dubstep of course! Accompanying Chastity’s cheerful dancing, were a fantastic range of facial expressions. With the audience clapping along to her every command, Chastity had no troubles when enlisting the help of some audience members during her act to hold some of her accessories. I found Chastity to be irresistibly cheerful, you couldn’t help but smile while she was performing. I can’t wait to see more from her. Interval time was suddenly upon the audience, and I used the time to speak to some of my friends in the audience and to see how my man was finding the show. I had not told him many details about the show, and he has only seen burlesque shows twice so far. I was pleased to see that he was enjoying the evening and appreciating all the different performance styles that were on offer, along with the various costumes. Interval time was quite generous, leaving ample time for audience members to get a drink from the well stocked bar, go to the bathroom or have a smoke (or all three!). Chante Dumont reappeared after interval to the delight of the audience, to sing classic songs and to share his unique brand of comedy. His singing voice was rather enchanting and took me away to another place and time. Unbeknown to me, for the rest of the show each performer seen in the first half returned with a completely different character and routine! I found this impressive as I could see how much effort each artist had put into their performances during the first half of the show. I was delighted to find the first performer of the second half to be Chastity de Vice! This time she appeared as a siren – the type of mythical creature that lives in the ocean, tempting men to their death. Chastity wore an elaborate headdress and used silk fans during her performance that mimiced the waves of the ocean. Chastity’s act was alluring and mesmerising, with her steady gaze and seductive silk fan routine. Chastity pulled all those in the audience under the waves with her, to the depths of seduction. 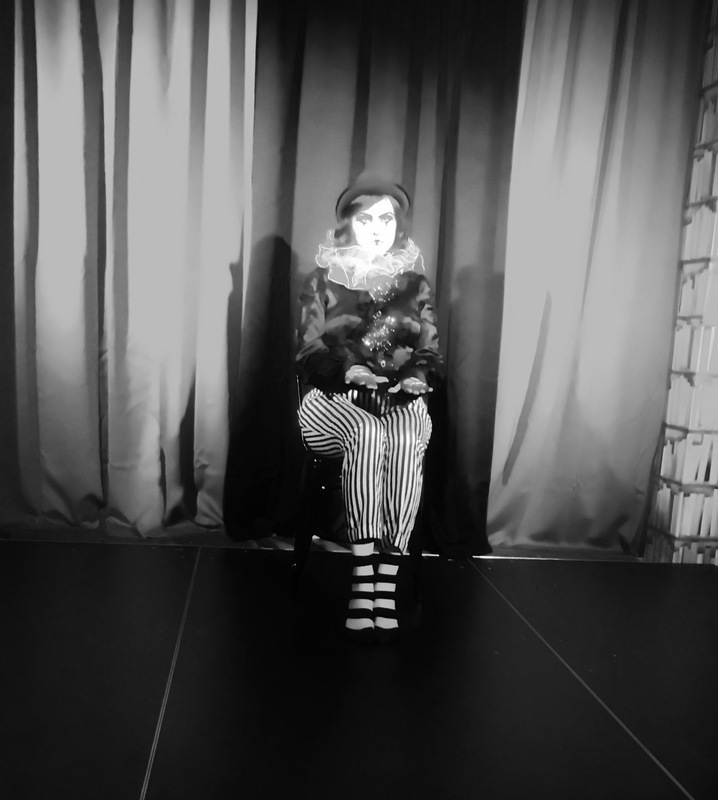 Viola Verve made her reappearance onstage as a doll-like mime. 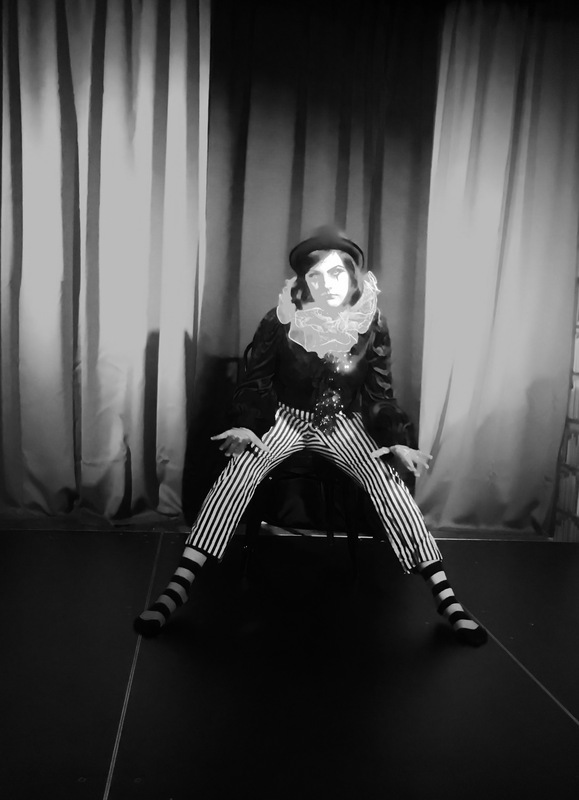 Viola was an adorable noir clown mime, with soulful eyes and a playful spirit. She paused during her routine to silently regard her audience and lap up the cheers and applause before removing her accessories and displaying a floor routine for her audience. I don’t see mimes very often in any areas of my life, so I was intrigued and enchanted by Viola’s every move. If you have the chance to see her perform, I’m sure you’ll enjoy watching her as much as I did! Viola’s act was followed by Sonny James, who also appeared as a mime. 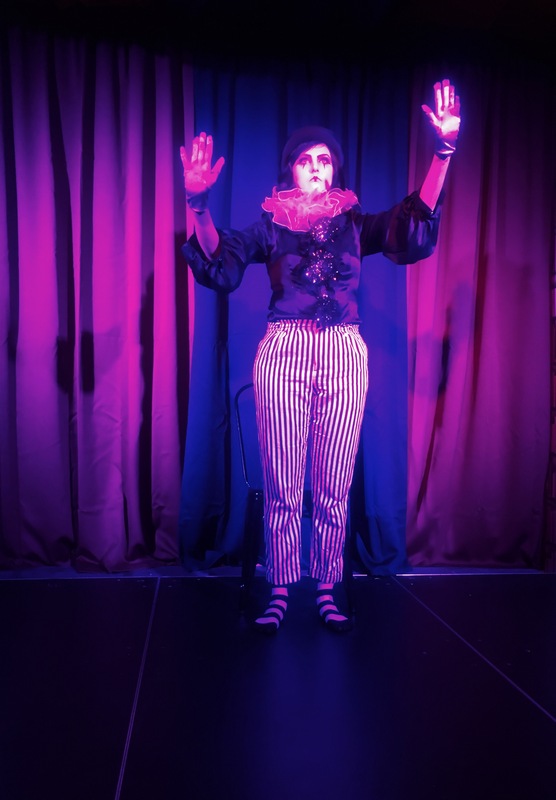 While the placement of two mime acts following each other seemed odd, Sonny’s performance was a completely different affair -a poignant piece of physical theatre, with poetic movements and political flair. Sonny’s performance was emotive, set to Leonard Cohen’s “Sound of Silence” and once again elicited a large round of applause and cheers from the audience. 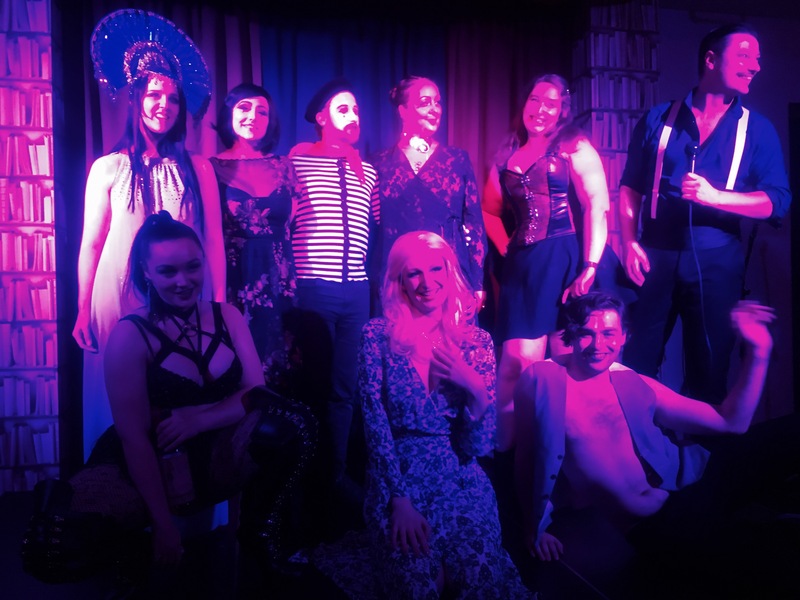 Approaching the end of the evening, O Nyx appeared as a complete “wild child” – think of a cross between a leather clad biker and a burlesque performer and you would reach O Nyx. O Nyx made a point of teasing her audience as she made her way to the stage – no one was spare from her glares, winks, straddles or pouts! Her performance was unbridled sass and raunch. I enjoyed her wild streak – whether she was on all fours and showing off her athletic body, or taking cheeky swigs from her bottle of Sailor Jerry. This routine from O Nyx even raised my temperature – I felt like a fire inside needed to be quenched after indulging in O Nyx’s routine. O Nyx knows you want her and may even deny you simply because of that fact so beware! As the evening drew to a close the headline act, Kerryx, appeared in a sweeping lace outfit with a veil over her eyes and performed a ‘pain versus pleasure’ routine. Kerryx depicted a mysterious stranger travelling to unknown places, and explored the boundaries between tension and seduction. Set to a song with a pronounced beat, Kerryx used her hands and an assortment of ‘toys’ in her suitcase to explore tension and pain. 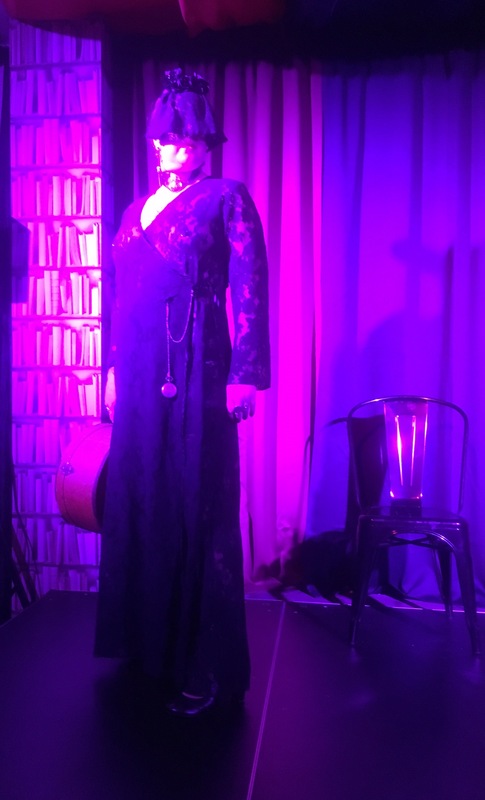 During this set, Kerryx towered over her audience, and when she regarded the audience under her gaze we were unaware of this, as she was veiled. I must admit that I find this performance style unusual. While I’m sure Kerryx was in no danger or extreme pain during the performance, I couldn’t help but wince and grimace at some points. It can be a challenge to witness this performance style if you’re not accustomed to it. I also found this was a strange act to end the evening with as it brought such a different vibe with it, however I appreciate that this may have been deliberate – the performance style was certainly memorable! As my man and I made our way home, the car ride was filled with animated chats about which portions of the show we enjoyed the most. I have to say that the standout performers for us were Chastity de Vice and O Nyx – both used their props well and had engaging expressions and storylines to their performances. I was also enchanted by Viola Verve, while my man especially enjoyed Sonny James’ storyline and props. This show was unlike any other show I’d seen, simply for the many distinct burlesque performance styles presented. 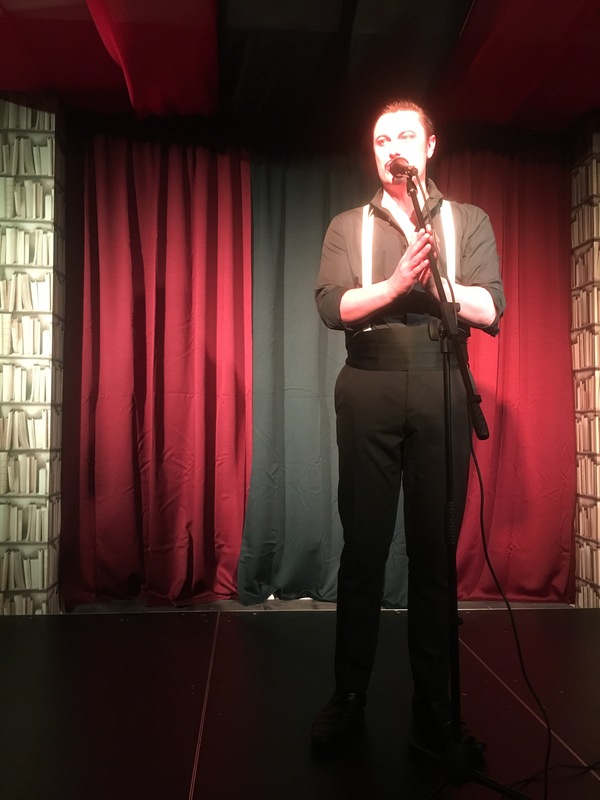 It was like a burlesque buffet, and I left the show feeling thoroughly entertained and blessed to have indulged in such an evening. I express gratitude to all the performers, and the producers (especially to Camilla Cream) for providing such exquisite entertainment. I believe ‘Le Grande Cabaret’ may be moving to a new venue soon, however be sure to keep updated via their Facebook page, along with the show’s producers – Cherries and Cream Productions. Relevant links are below. *Disclaimer: we attended this show as guests of Camilla Cream.